To start the month of November, we highlighted the importance and impact of corporate social responsibility. This week, we’d like to share more about how we, at FMP, translate some of these principles into our everyday work. FMP has a culture that values a dedication to service, both to our clients and the community. Our Charity Team exists as a tangible arm to sponsor a variety of service events and other charitable efforts for our employees throughout the year. We have long understood the value of promoting service and giving, particularly since providing employees opportunities to engage in these types of activities can promote engagement and improve connection to organizational culture (Beckstrand, 2018). While your organization may already have a team or committee responsible for charitable efforts, we’d like to offer some of our proven processes and practices, along with examples of the activities and organizations we’ve supported over the years. Our team consists of more than 10 charity-minded employees, from senior management to the consultant level. This allows for diverse perspectives and offers an opportunity for everyone at FMP to get involved, a key tenet for meaningful corporate charity according to best practice (Beckstrand, 2018). Our only requirement for joining the team is an interest in getting involved and the Charity Team models FMP’s value of flexibility for our members. Collectively, we are always busy supporting various charitable efforts; however, by supporting flexible time commitments across the team, members can dedicate time to planning or attending events and team meetings as their schedules allow. As a best practice, we try to meet at least every other month. These informal meetings allow us to keep a pulse on upcoming events, discuss new ideas or areas of interest, and celebrate recent successes. With so many options out there, how do we choose the events and charitable organizations to sponsor? To start, each year we create a calendar of service events and other charitable efforts, making sure to coordinate with our Social Committee, Work-Life Effectiveness Team, and Learning and Development Committee. This allows us to have an active calendar of activities for the workforce all year long without clustering things too close together. It also enables us to co-market certain efforts. For example, we may join forces with the Work-Life Effectiveness Team to promote a charity 5k as part of a broader wellness initiative. We plan a variety of opportunities so that as many employees as possible can get involved. For example, our annual plans include a mix of voluntary activities that take place on-site and off-site, on weekdays and weekends, and involve both donating time and donating items. We also have a combination of tried and true events and organizations we’ve supported year after year and which employees come to expect, along with new events to incorporate timely or specific interests. We aim for a balance of volunteer work that aligns with our company’s services and skills, along with other activities that support employees’ personal interests (e.g., animals, fitness, food). 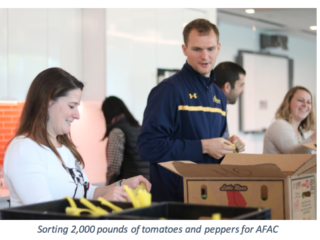 While our team members do the majority of the planning and coordination of service events and donation drives, we look to the whole workforce for ideas on what types of activities people enjoy and the causes that are meaningful to them. We conduct formal surveys every few years, and short pulse surveys periodically, when we are looking for more specific feedback on the timing of events, satisfaction with events, or preferences and ideas for different types of events. Team members also represent each of FMP’s management teams, which enables us to ask for input informally throughout the year. While we set our overall plan in advance, we make sure to build in flexibility so we have room to respond to specific interests sooner than the following calendar year. 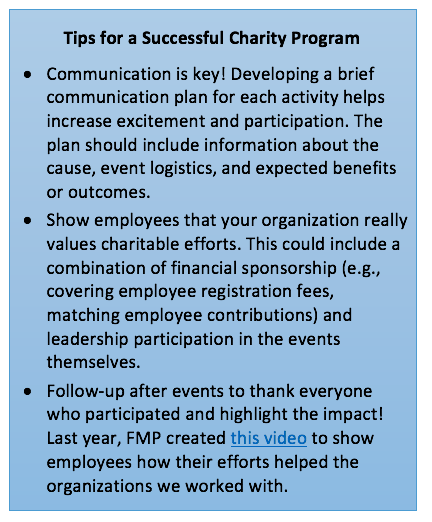 In addition, to empower employees to commit time toward these activities, FMP implemented a separate timesheet code for charity events. We found this helps send a clear message that FMP values employees’ time spent on service and giving. Our annual calendar is always full…check out just some of the service events and charitable activities we sponsor! ALIVE! and FMP – 7 years and counting: ALIVE! offers a variety of programs to help Alexandrians in need of food, housing, childcare, and other assistance. FMP connected with ALIVE! through one of our co-founders, and we have maintained a partnership with them for over 7 years. We have a standing slot in the monthly delivery rotation for the emergency food program. One Monday per month, a pair of FMPers pick up groceries at the ALIVE! warehouse and deliver them to local families. Employees at all levels of our organization have participated in this program over the years, from interns to our CEO. 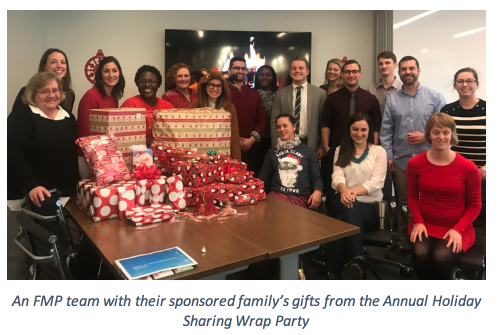 Annual Holiday Giving: For the past 6 years, FMP has sponsored families for the Fund for Alexandria’s Child Holiday Sharing program. Our teams each receive one family’s wish list and coordinate to purchase gifts, clothing, and needed household items. 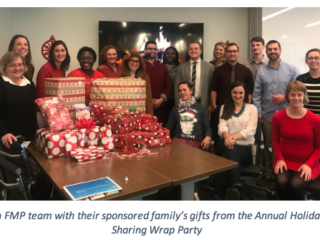 Once the shopping is done, we host a gift wrapping party in the office to package everything for delivery – and celebrate the holiday season while we’re at it! Eggnog anyone? 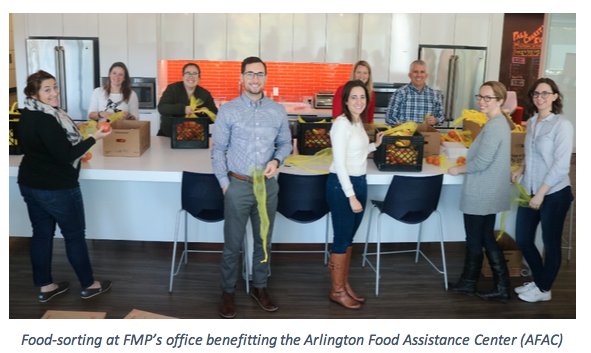 Helping our neighbors without leaving the office: This year, FMP partnered with the Arlington Food Assistance Center (AFAC)– a close neighbor to our Shirlington office. We sponsored the purchase of about 2,000 pounds of produce. 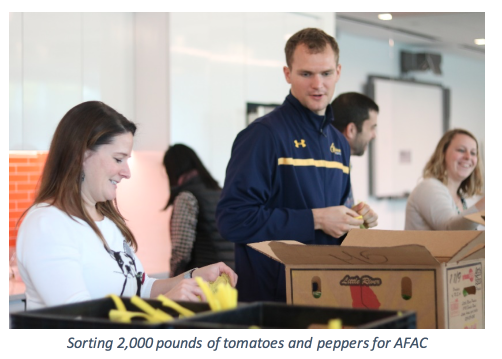 AFAC delivered 70 crates of tomatoes and peppers to FMP’s office, and our employees worked in shifts to help sort the food into individual family-sized bags. This took place around lunch time, so employees were able to drop in and participate when they had time during the day. The bagged produce then went back to AFAC’s warehouse, and from there, went home with about 250 local families. 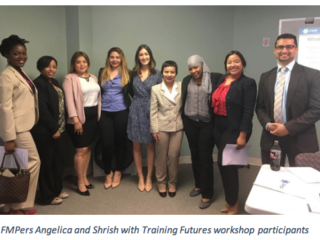 Using our professional skills to give back: FMP has worked with Northern Virginia Family Services’ Training Futures program for the past 6 years. 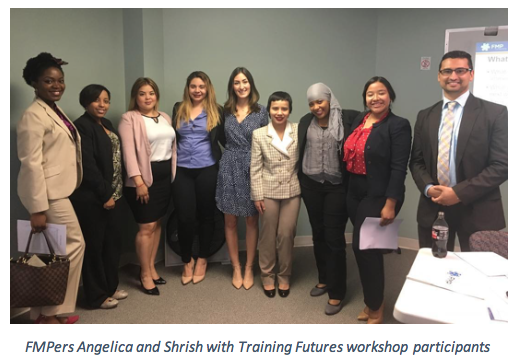 Training Futures is a nationally recognized workforce development program helping unemployed and underemployed adults build the technical and soft skills they need to move into professional careers. We originally connected with this program in an effort to use our consulting and training skills to give back to the community. We have stayed involved because it’s a great program, and dozens of our employees have enjoyed developing and delivering 6-8 interactive workshops each year on topics such as communication and conflict management, time management, feedback, and emotional intelligence. We have also engaged in email mentoring with Training Futures students in the past, and have helped staff NVFS’ clothing closet to support students as they select items to build their professional wardrobes. 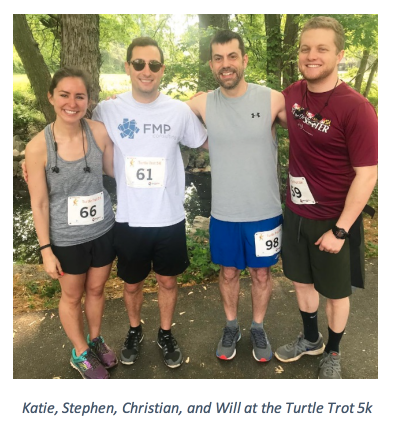 Employee-driven ideas: In addition to our long term partnerships, the Charity Team likes to include new events and donations drives each year that other FMP employees suggest. For example, we’ve collected clothing and household items for an employee’s home town following a hurricane, and participated in a 5k to support juvenile arthritis research due to a personal connection with one of our subcontractor partners. We are currently participating in a Dress Drive with one of our vendor partners to collect professional clothing for Women Giving Back. We hope these examples have sparked some ideas about how your organization can give back to your community. Upon reflection, we challenge you to dedicate time, money, and employees towards charitable efforts as part of an overall strategic plan to improve company culture, drive employee engagement, and demonstrate your organization’s corporate social responsibility. Looking for other ways to achieve these strategic outcomes? Contact us to learn more about how we can partner with you to tackle a wide-range of human capital challenges. When she isn’t supporting Charity Team events, Christine enjoys partnering with her clients to think more strategically and data-minded about learning and development programs. In her free time, you can also find her dominating FMP’s fantasy football league (sorry, not sorry! ), reading up on the latest Royal family gossip, and attending barre class. 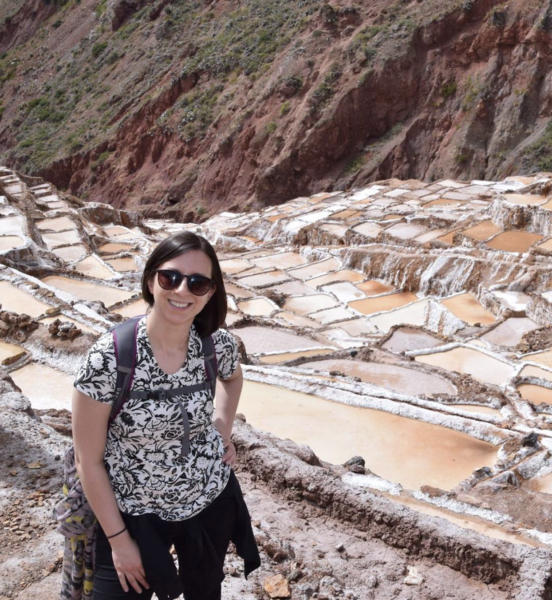 In addition to planning service activities with FMP’s Charity Team, Cristina enjoys partnering with clients on a variety of strategic human capital initiatives – from compensation and staffing analyses to engagement surveys and career development programs. 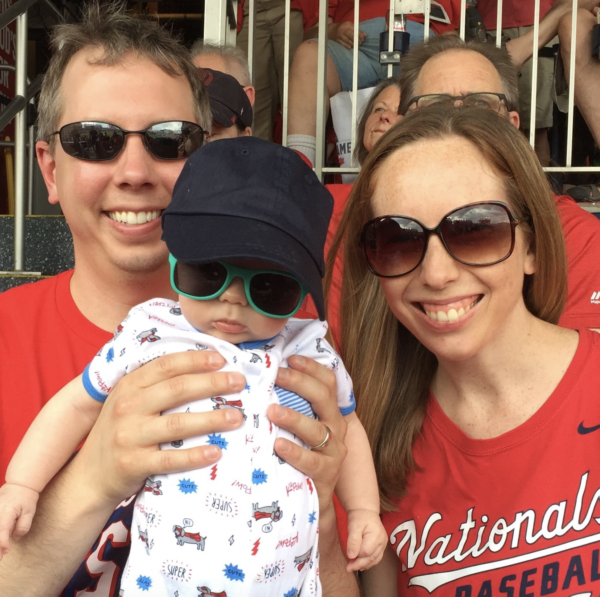 Outside the office, you can find her hanging out with her family, spending time outdoors, and constantly adding to her travel bucket list.